Be the first to share your favorite memory, photo or story of Judith "Judy". This memorial page is dedicated for family, friends and future generations to celebrate the life of their loved one. 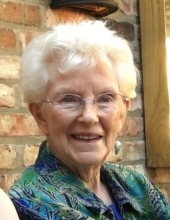 Judith F. Kavanagh, age 85, of Ames, passed away on April 1, 2019. A memorial service will be held at 2:00 P.M. on Friday, April 5, at St. John’s (By the Campus) Episcopal Church in Ames. Visitation will be held for one hour prior to the service at the church and burial will be in the St. John’s Columbarium. Born on August 9, 1933 in Des Moines, Judy was the daughter of Charles and Bernice (Christy) Firkins. She graduated from Roosevelt High School in 1951. Judy attended Drake University and was married to Patrick Kavanagh on November 22, 1952 at St. Paul’s Episcopal Church in Des Moines. The couple lived in Santa Monica, CA, and moved to Kelley, IA in 1957, before settling in Ames in 1960. Judy was a homemaker, raising the couple’s four children. She was co-owner of the charming gift shop The Christmas Attic in Ames for several years and she enjoyed gardening, reading, and sewing. Judy loved antiques, especially her Waterford and Belleek collections, and she actively participated in Quester’s. She enjoyed dancing and was a member of the Octagon Tappers and Red Friars. Judy impacted many volunteer organizations; including PEO, Ames Library Board and book delivery, Meals on Wheels, as well as too many to mention roles and contributions at St. John’s. Judy is survived by her husband, Pat; her four children: Patrick Kelly Kavanagh of Fort Collins, CO, Kathy (David) Johnson of Naperville, IL, Christy (Brad) Gustafson of Burlington, VT, and Michael Kavanagh of Arlington, VA; four grandchildren: Maeve Gustafson, Evelyn Gustafson, Clare (Tim) Johnson Bartolomei, and Michael (Melissa) Johnson; and two brothers: Dr. Richard (Bev) Firkins of Des Moines and Jack Firkins of Tacoma, WA. She was preceded in death by her parents. Funeral arrangements are under the direction of the Adams Funeral Home. Online condolences may be left for the family at www.adamssoderstrum.com. To send flowers or a remembrance gift to the family of Judith "Judy" F. Kavanagh, please visit our Tribute Store. "Email Address" would like to share the life celebration of Judith "Judy" F. Kavanagh. Click on the "link" to go to share a favorite memory or leave a condolence message for the family.